Quit making me laugh; I’m trying to be mad at you! 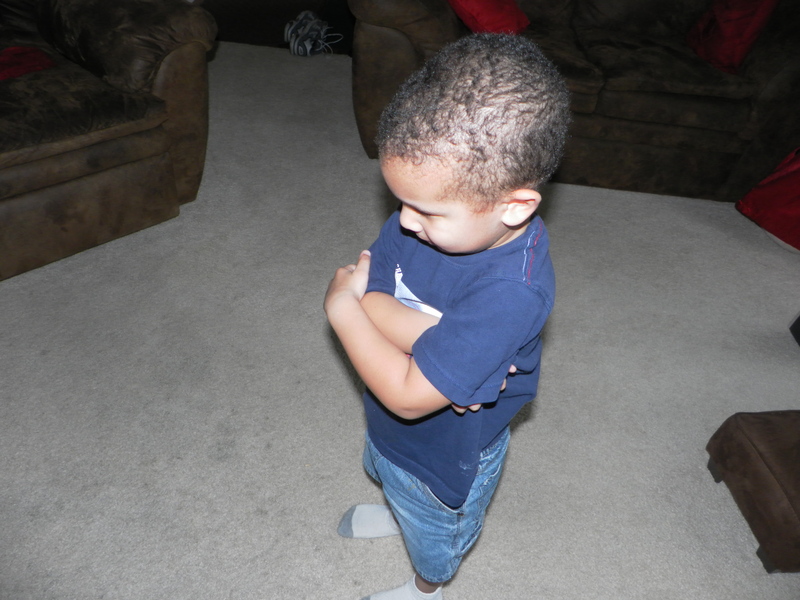 My son has reached the age when he wears his emotions on his sleeve. It’s not that he can’t control his emotions, or hide them if he wanted to, he just wants to make sure Mommy and Daddy notice the terrible effects that their horribly unfair actions are wreaking upon his tender psyche. 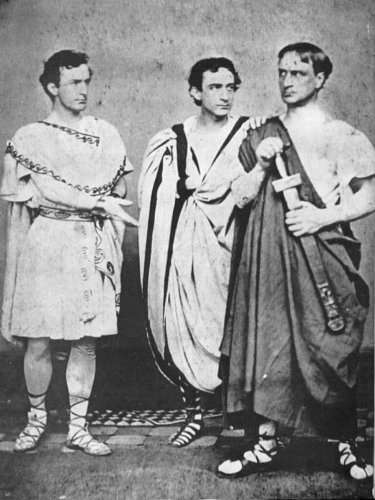 John, Edwin, and Junius Booth. The first family of 19th century American drama. My little pouter. The first boy of 21st century American drama. So, he lowers that cross stare over his face, fold his arms tightly, and sits down hard upon some object that is not a chair. He roosts on a spot that is far enough away so that I can feel the emotional gulf that my unreasonable edicts have opened between us, but close enough so that there is no danger of me not seeing him. Thus begins my punishment. Sic semper tyrannis. I have never been much for histrionics, and I don’t enjoy sitting in the radiation of waves of guilt powerful enough to cripple. I have to defend myself; I have found no better way to do this than by making the pouting little thespian laugh. This completely ruins his performance and saves me from becoming a man broken by guilt. It is rare that I can make the boy laugh so hard as to forget all about his grudge, but I can often make him laugh just enough to make his grudge a burden to support. It is difficult to exude crushing guilt vibes when you are giggling. Even though he can’t always keep himself from giggling, my son does not like it one bit when his grudge is thrown out of focus by laughter. As soon as he can stifle the giggle, he makes his face look meaner than ever and grunts his displeasure at me. I understand that, in the short term, I am doing little to soothe his anger. In the long term, maybe I am teaching him that the power of the pout, although seemingly immense, will almost never get him what he wants. 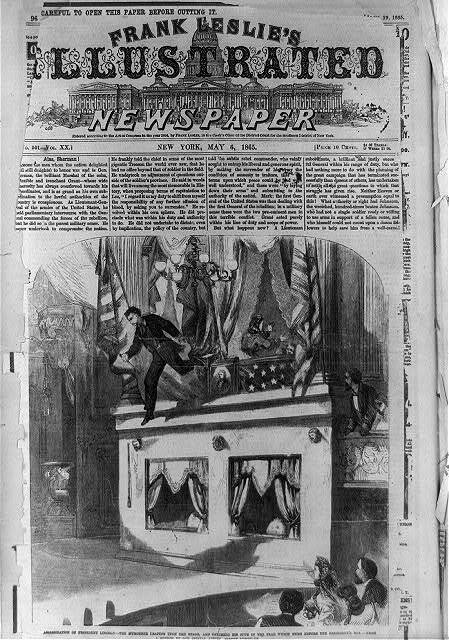 If little Johnny Booth had ever outgrown his pouting stage, he might have avoided breaking his leg during this ill-advised leap from the theater balcony. This is not the sort of dramatic personality I want my son to become. Before anyone gets the idea that this method of attacking the scowl with laughter has given me the upper hand over the child, I should make it clear that he uses the same strategy on me. I’m sure other parents have experienced this: The kid does something naughty. You’re ready to give him a stern talking to and lay down the law. The problem is that the thing that was naughty is also hilarious, and you can’t even look at the child, let alone speak to him, without bursting. This is an especially volatile situation if Mommy doesn’t think it’s funny, because then Daddy is implicated in the naughtiness. Mommies know how to punish daddies as well as children, and Daddy can’t make Mommy laugh away her cross face, no matter how funny his jokes are. But, there are plenty of times when Mommy is laughing right alongside Daddy, and neither one of them can manage to turn a stern face toward the boy. My son uses humor to try to turn a dicey situation to his advantage quite regularly. It is a peculiar disposition of his. I don’t know where he gets it. This entry was posted in Parenting Issues (i.e. Mistakes) and tagged drama, Edwin Booth, humor, Humour, John Wilkes Booth, Junius Booth, lay down the law, pouting, power of the pout, Sic semper tyrannis. It’s been a long time, but I remember that look! My girls also humphed while crossing their arms on their chest. As long as they’re not still doing it, I think you’re okay. This happens all the time with my grandchild. It’s very hard for me not to laugh because the grandchild is so cute. They are always manipulating us with their cuteness. Kids would be so much easier to keep in line if they were all homely.